The United States military is likely reduce the number of special operations commandos deployed in Africa. But military officials tell VOA that a final decision on the move has yet to be made. American military experts have mixed reactions to the planned reduction. The New York Times first reported the plan this past week. It said the number of commandos in Africa could decrease from about 1,200 to 700 over the next three years. The proposal follows a Department of Defense investigation of an incident involving four U.S. Green Berets. The four were attacked and killed while they were on duty in Niger last October. 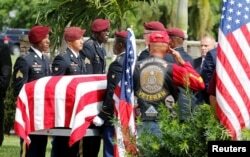 FILE - An honor guard carries the coffin of U.S. Army Sergeant La David Johnson, who was among four special forces soldiers killed in Niger, at a graveside service in Hollywood, Florida, Oct. 21, 2017. The investigation identified several problems, including poor training and direction by military leaders. The attack led some members of Congress to demand a smaller U.S. presence in Africa’s Sahel region. Major Sheryll Klinkel is a spokesperson for the defense department. In a statement to VOA, she said the U.S. is always studying where to deploy forces around the world and makes changes based on needs. Klinkel added that there “has been no direction at this time” to change the size of the U.S. Africa Command. John Campbell is a former ambassador to Nigeria and a member of the Council on Foreign Relations. He told VOA that military officials are concerned that U.S. Special Forces are overextended in Africa. 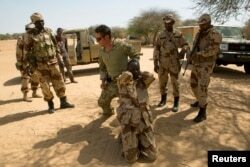 FILE - A U.S. special forces soldier demonstrates how to detain a suspect during Flintlock 2014, a U.S.-led international training mission for African militaries, in Diffa, Niger, March 4, 2014. Campbell added that the goal of Special Forces in Africa has been to train African militaries to help countries improve their own security. "I think that type of training can and should be provided, but it doesn't have to be provided by Special Forces," he said. But other observers have questioned the timing and the reasoning for the decision. 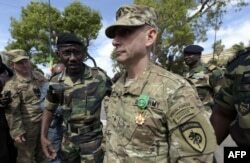 Former commander of Special Operations Command Africa Donald Bolduc said the attack in Niger shows why the U.S. needs to have a presence in the area. He added that the military has already had a difficult time against violent extremist organizations in the Sahel. US General Donald C. Bolduc (C) walks on after been awarded with the officer decoration of the National Order of the Lion during the closing ceremony of the three-week joint military exercise between African, US and European troops. Bolduc said the territory that extremists often occupy, usually rural with intense weather, is the "quintessential special operations force environment." He said that only the most highly trained forces can operate there to secure the region for non-governmental organizations, the United Nations and local partners. "Without the presence that we have there now, we're just going to increase the effectiveness of the violent extremist organizations over time, and we are going to lose trust and credibility in this area and destabilize it even further," Bolduc said. Salem Solomon wrote this story for VOANews.com Phil Dierking adapted his story for Learning English. George Grow was the editor. Do you think the US should decrease its military presence in Africa? Write to us in the Comments Section or on our Facebook page. Should the US Help Fight Terrorism in Africa’s Sahel?